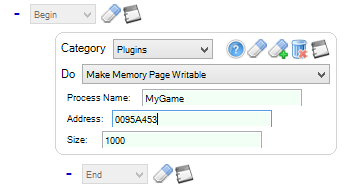 MemoryPwner is a plugin designed for Blue Eye Macro, in which will greatly help those developers which finds themselves against the impossibility to Read/Write/Execute an area in memory which is Read Only, by internally modifying the memory page area that you would like to have All Access, without the needing of additional programming! Everything was done already for you! This will be my first ever release, My one and only wish is to help lots of people that probably want to accomplish what they want to do with their game through this plugin! [*]Add Pointer Support to addresses. Good job on the plugin. I haven't tested it, but I'm sure it works like you described. Additional CP has been awarded - after verification we will probably award you more. thanks for joining in the thread, well to put it in a nutshell, this plugin will help you whenever you want to write something like a memory based bot, well, you might know that not all games will grant you "Free Access" to every single line of code that they bring, and in my case with the game I showed in the video, the game had a portion in a certain memory page that the access or permissions of the game was set as, Read Only, this prevents users or developers working with that specific memory area by "Locking" such memory portion and preventing them from modifying it, to do stuff that they want, etc, etc. With my plugin what you can do is to get the address of the specific area you would like to modify, then the size in bytes you would like my plugin to modify, and then execute the plugin, it will open the permissions of the area in memory that you wanna modify, making them Executable, Readable and Writable, in other words granting you that "VIP Access" that you need, to do what you would like to do with that memory. I reviewed the code in the plugin. Here is a direct download link of the version I reviewed.